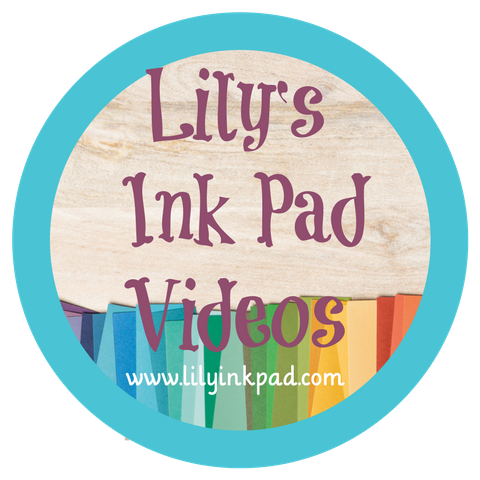 Welcome to the Lily Ink Pad stop on the Inky Friends New 2017-2019 In Color Blog Hop. 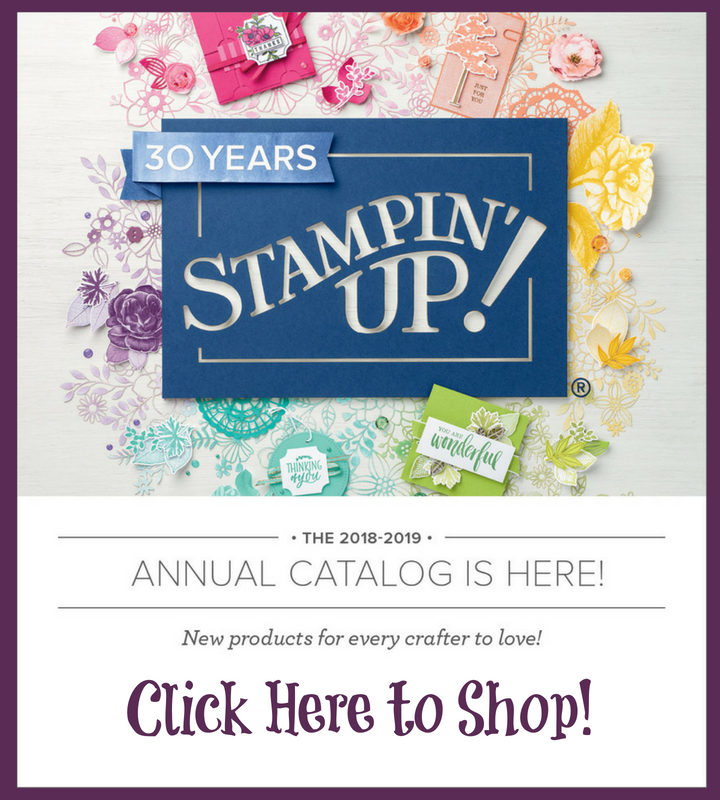 Each stop on this hop features one of the newest In Colors from Stampin' Up!. There are two for every color! How awesome is that? 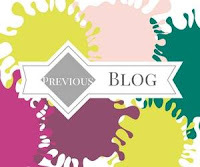 You may be starting here with my Fresh Fig post, or perhaps you came from Yapha's blog featuring Berry Burst, or backwards from Shelley's Lemon Lime Twist. Fresh Fig is a deep purple, but with a dusty tinge. I love the tone of the color as well as how it pairs with other colors so well. 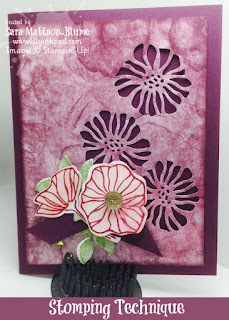 Basically, I used the watercolor flower from the Oh So Eclectic Stamp Set and stamped it repeatedly to create the background. I would ink it up and then stamp until it was out of ink, and then go again. It was very stress- relieving. The flowers are Blushing Bride with a Cherry Cobbler veins. For extra bling, I added a Gold Glimmer Enamel Dot. 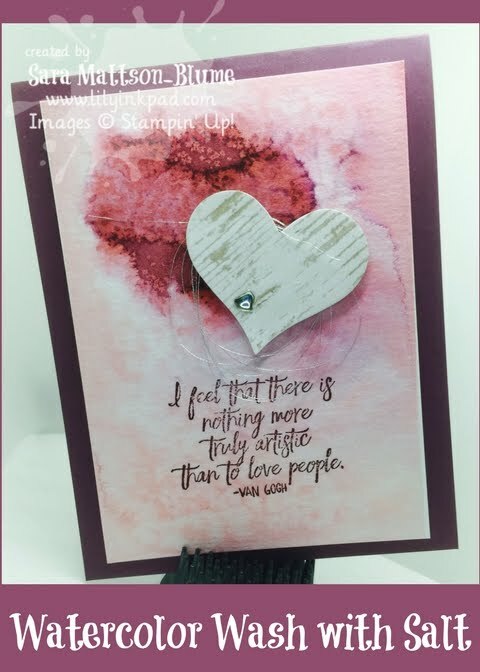 My second project is a card using a watercolor wash with salt. I love this look. I added a sentiment from Just Add Text and a heart cut out of the Wood Textures Designer Series Paper. Lovely, but quick and easy. My final project is a display board for my wall. I bought the unfinished piece eons ago and finally decided what to do with it. I painted it Fresh Fig by adding reinker to white acrylic paint. 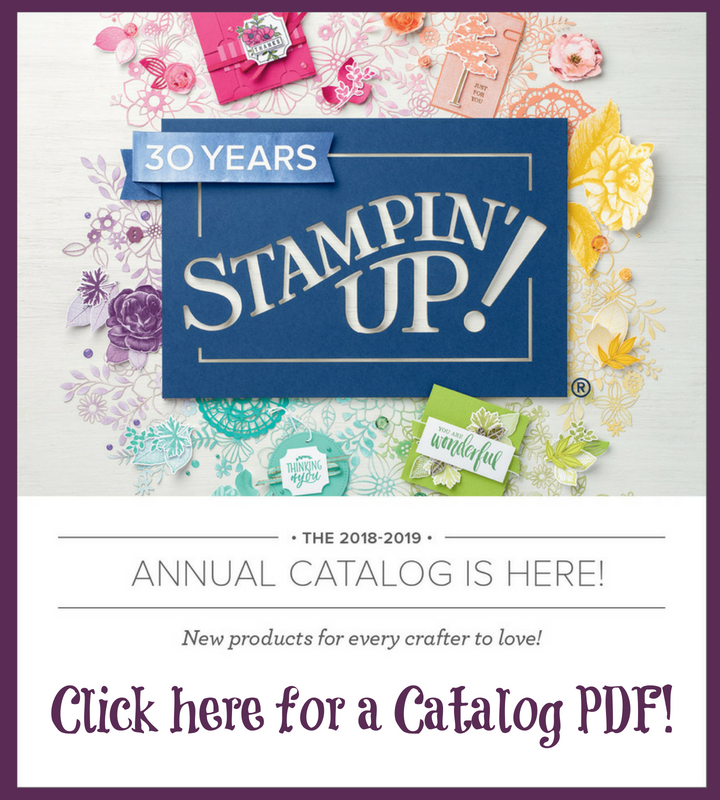 The inside is the Fresh Florals Designer Series Paper which I "quilted" by cutting it into 2" right triangles and adhering them to a background. 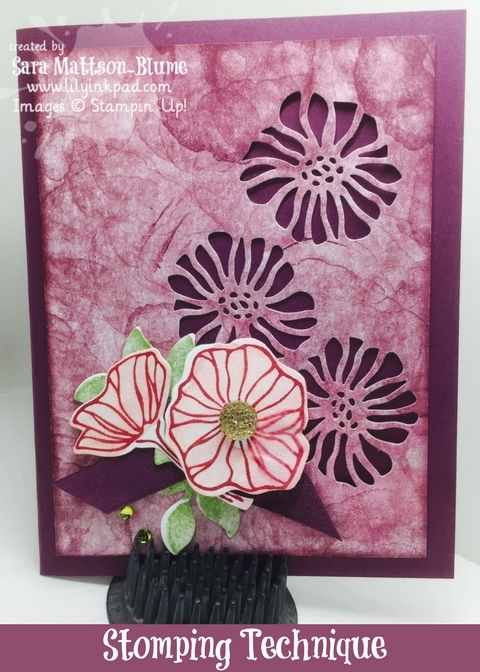 I added one of my favorite flowers, echinacea, which I made with Wistera Wonder cardstock stamped with Fresh Fig and then punched out. 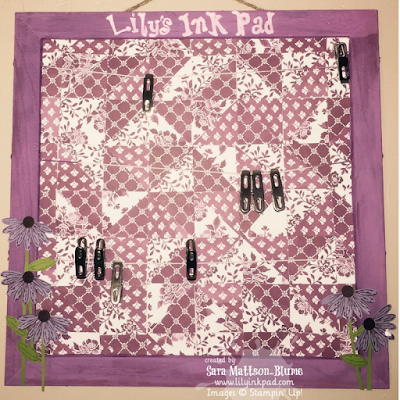 I used halves of each flower to get the signature look of the Prairie Purple Coneflower. Well, I hope you loved my projects as much as I do. More details will appear on my blog on Sunday, but until then, hop on over to Shelley's Blog to her projects featuring Lemon Lime Twist. Okay, I don't want to appear dumb! Too late for that! Did I make you smile? I hope so. Anyway, I don't know what the Watercolor with salt is. Would you share with me or point me in the directions of videos? Any and all help is appreciated! WOW! Can't wait to try some new techniques. Love the projects! Such pretty designs with this rich color....So pretty! Great projects, Sara! Love the comment about the stress relieving with the stomping. So glad you were doing that on paper! 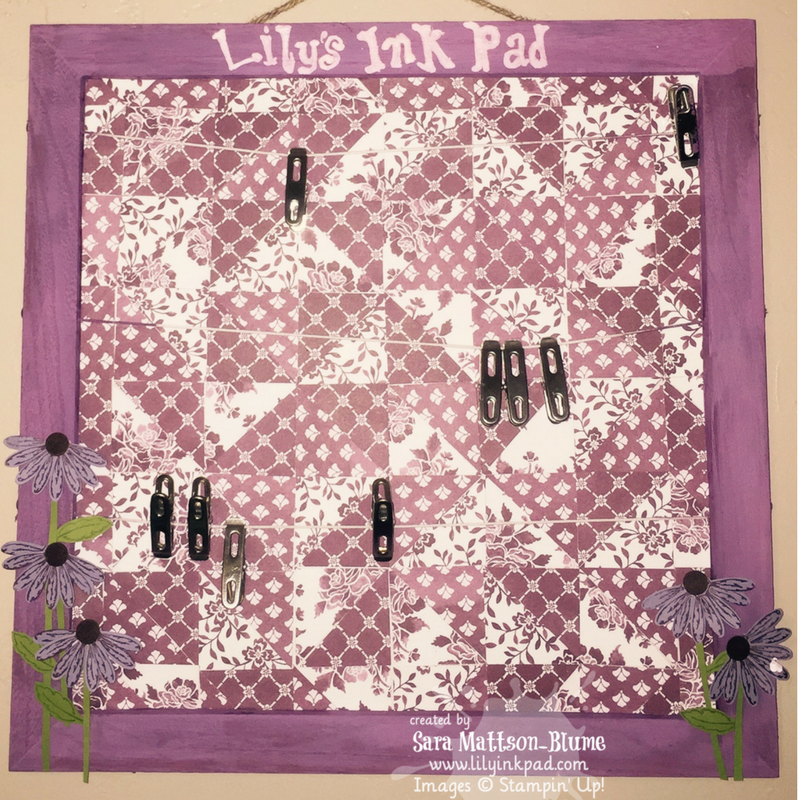 Love the watercolor wash and your display board. Great ideas! What. Wonderful way to use this color! Hope you enjoy your display board. Great cards, Sara! I really like the stomping technique on the first one. Awesome display board, too! Love these! I can't decide which card is my favorite. I'm gonna say both of them. Love your display board. So fun to alter things.